Do not remove or install the timing gear (VVT-i) unless you are replacing the VVT-i or the camshaft. (b) Apply engine oil on the nut, the mounting surface of the VVT-i and the screw threads. (h) Apply a light coat of engine oil to the threads of the bearing cap bolts. 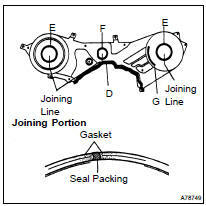 NOTICE: Affix the gasket in the center of the groove. NOTICE: The torque specification above is for the SST without extension tool specification. Use the special formula to calculate the SST with extension tool torque specification (see page 01-5 ).